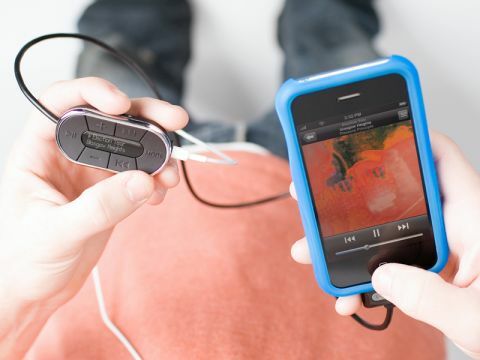 The Griffin Navigate connects to your iPod or iPhone's dock port and gives you a handy remote control and FM radio. It only works with USB-charged devices, so if your iPod came with a FireWire dock cable, steer clear. The controller clips to your clothing and you can change tracks, adjust volume and switch to the mediocre FM tuner. It also displays the playing track's name and artist. Unfortunately, the clip isn't versatile; if you attach it to a man's shirt the display is upside down.